Russia has launched one of the biggest security operations in Olympic history, a month before the start of the Winter Games in the Black Sea resort of Sochi. The authorities are deploying more than 30,000 police and interior ministry troops and limiting access to the area. The main concern is the threat of attack by Islamist militants from the restive North Caucasus region. Russia's most wanted man, Chechen rebel leader Doku Umarov, has urged his fighters to target the Winter Olympics. The BBC's Steven Rosenberg in Moscow says recent deadly bombings in Volgograd have intensified those worries. The Russian authorities are in a difficult position. They know that the Winter Olympics are a prime target for terror attacks - Chechen rebel leader Doku Umarov has already threatened "maximum force" in an effort to disrupt the Games. Moscow has no choice but to ensure the maximum possible security in Sochi. But last month's suicide bombs in Volgograd show that Russia's security problem extends beyond the Black Sea. Terror groups could strike anywhere. It is hard enough securing an Olympic city. It is almost impossible to secure the whole country. Russians fear there could be further attacks on "soft targets" away from Sochi in the run-up to the Games. Last November, in the southern Russian city of Rostov, security forces took part in a training exercise. The scenario: A hospital seized by terrorists. It shows how seriously the authorities are taking the threat of violence. 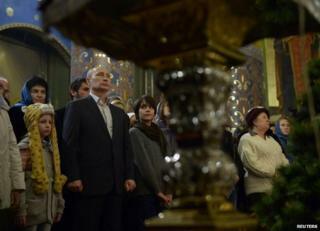 President Vladimir Putin was in Sochi on Monday night to celebrate the Orthodox Christmas, appearing at a church service. "Starting 7 January, all divisions responsible for ensuring the guests' security at the Games are being put on combat alert," Emergency Situations Minister Vladimir Puchkov said. "Every facility will be put under protection and a space-based monitoring system will be launched." Russian officials are establishing two security zones to protect the Games. A "controlled zone" near Olympic venues will limit access to people with tickets and proof of identity while another "forbidden zone" will be in place in large areas around Sochi. "Every sport venue is fully prepared and has been thoroughly tested, new road and rail routes are ready to transport visitors and rehearsals for the opening ceremony are well under way," Sochi 2014 Organising Committee President Dmitry Chernyshenko said. "Athletes, coaches and the media have all received their official accreditations and are gearing up to travel to Sochi, where our volunteers and staff will give them the warmest of welcomes." Mr Chernyshenko said that "Sochi will be a truly memorable Games... That will amaze audiences across the world". He said that Sochi's "new year-round resort" forms "part of the legacy of the Games that will transform the region for generations". Vehicles not registered locally and which do not have special accreditation will be banned from the city. The sale of firearms, explosives and ammunition will also be prohibited. Security fears have been heightened after two suicide bomb attacks killed 34 people in the southern city of Volgograd on 29 and 30 December. Investigators believe the perpetrators were two men who arrived in the city from the North Caucasus region. The bombings prompted Mr Putin to order further security measures and personally inspect Olympic sites. In recent years, a conflict between Russian forces and separatists in Chechnya has fuelled attacks by Islamists. The violence has spread across the North Caucasus, including to mainly Muslim Ingushetia and Dagestan, killing hundreds of people, among them members of the government and security services.